A fun and interesting move that will quickly become a favorite. Its knacky and effective and will be sure to impress the spectator. This is not just a move it is a blast of fun! And a bonus.. The TimeFlies Transpo! 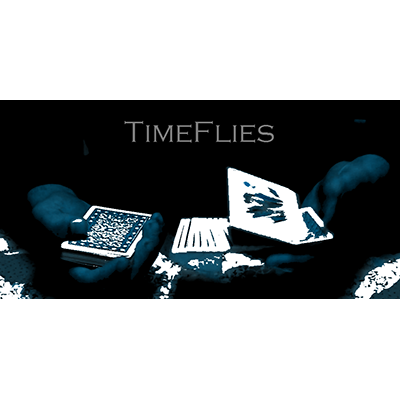 There is not much else to say about TimeFlies except just practice, practice, practice!!!! This move is not for the faint of heart so grab you decks and get ready for a knacky ride because once you try it your hands will be addicted to this! "Oh I don't like it.. you just don't like a move like this.. you kind of adore it! Man! This is beautiful!" "John Stessel has taken his black magic and adapted it to a very fun, flashy, unique new double lift with a million applications!" "Who said you cannot re-invent the wheel? John has taken the wheel and added slick new rims with this flashy new twist on the double lift." ****Extra credit goes to Lee Asher's Diving Board Double!!! !